The Spotted Bear Ranger District closed its portion of the Bob Marshall Wilderness due to the fire danger . . .
As fires bloom, the options to recreate in the Bob Marshall Wilderness are rapidly diminishing. The Spotted Bear Ranger District will shut down the entire wilderness portion of the district because of fires and fire danger beginning Friday morning, fire information officer Al Koss said. That includes lands in both the Bob Marshall and the Great Bear Wilderness. The non-wilderness portion remains open, though the Spotted Bear Campground is closed. Koss said wilderness rangers are giving who are already in the backcountry a few days to get out of the area. The decision came as multiple fires burn in the district. One new fire, detected yesterday, is near Lena Lake in the wilderness. That fire is now 40 acres in size. That forced the closure of the Holland Lake trailhead. The Meadow Creek Trailhead is also closed due to the fires. Here’s a good summary of the wildfire situation throughout this corner of Montana . . . Authorities closed a section of U.S. Highway 2 near Essex on Thursday to provide safe access for firefighters battling the Sheep Fire, a 232-acre blaze that has grown to within 1 mile of the highway and river corridor near the southern boundary of Glacier National Park. There are no evacuation orders, but Flathead County Sheriff Chuck Curry and his deputies notified 106 residents in and around Essex that they must prepare to leave and recommended they begin loading their cars immediately, Flathead County emergency information officer Jennifer Rankosky told the Associated Press. Forty-two people were home and notices were left at the rest of the homes. Over 200 structures in the area are at risk, including homes, according to fire managers. Fire and county officials were assessing how to best protect structures in the community. Red Cross officials were preparing a shelter in West Glacier 30 miles north on U.S. Highway 2, Rankosky said. Sounds like Deb Mucklow, the Spotted bear District Ranger, gave an interesting presentation about managing the Bob Marshall Wilderness . . .
From the remote Spotted Bear Ranger Station, District Ranger Deb Mucklow spends each summer overseeing more than one million acres within the Bob Marshall Wilderness Complex. The Lower 48’s third-largest wilderness complex has become a star attraction for Northwest Montana. But as the Spotted Bear District ranger, Mucklow emphasized the difficulty in balancing human activities with the integrity of the primeval area during a recent presentation hosted by the Bob Marshall Wilderness Foundation. Frank Vitale was one of the panelists at last Thursday’s MWA “Wilderness Speaker Series” presentation. Here’s a transcript of his remarks. Nicely done; recommended reading . . . It was probably 20 years ago I planned a pack trip out of Cave Mountain up in the Teton drainage. Our destination was “as far as we could go in about 8-10 days.” We had to travel over Route Creek Pass and I had never been on that trail before. So I decided to give Roland Cheek a call. He told me to “Come on over and bring your map. It just so happens Route Creek Pass is one of my favorite trips in that part of the Wilderness.” So after a great visit and a drink or two, Roland marked on my map the best places to camp with good water and good grass. He didn’t steer us wrong. I don’t think I ever told you how much I enjoyed reading your newspaper column, “Wild Trails & Tall Tales,” from back in the early 80s, so while I’m thinking of it now I just want to say it’s an honor to sit on the same side of the table with you. In our discussion about wilderness, politics always seems to come up. It’s sad, but true, but anything in life that’s worthwhile never comes easy. This is also true for wilderness. The wild country we have today is by no accident. It had to be fought for. At time things got ugly. Wilderness and politics are wrapped together and I suppose it will always be that way. But spending nearly my whole life in wild country I guess I’ve learned to let the heart speak first. It was not always like that, and when I was younger it was easy to get mad as hell and frustrated. But youth being no easy keeper, the words for wilderness come a whole lot easier. I would tell the young folks that everybody needs a hero, a mentor; someone to look up to. My advice for you young folks is to find your heroes and learn their stories. From early on I had many heroes. Way too many to even have time to mention. Some of my heroes are even probably sitting in this room tonight. Last week’s Flathead Forest Friday was all about the upcoming 50th anniversary of the Wilderness Act. Chris Peterson of the Hungry Horse News provides the background . . . In September 1964, the country was in turmoil. There was a growing war in Vietnam, the country was still suffering the effects of the assassination of President John F. Kennedy, and there was a growing cultural revolution. In the midst of this, Congress passed and President Lyndon Johnson signed the Wilderness Act, which immediately protected 9.1 million acres of lands across the U.S., including the Bob Marshall Wilderness. The area that became the Bob Marshall Wilderness had been administratively-designated as wilderness by the Forest Service in 1940. The Wilderness Act gave it congressional protection. Next year marks the 50th anniversary of the act, and Forest Service officials along with the Bob Marshall Foundation, the National Park Service and other stakeholders are beginning plans for events and celebrations of the birthday. Wildfire activity in “the Bob” picked up a little yesterday . . .
A lightning-caused fire in the Bob Marshall Wilderness grew to 1,375 acres on Saturday. 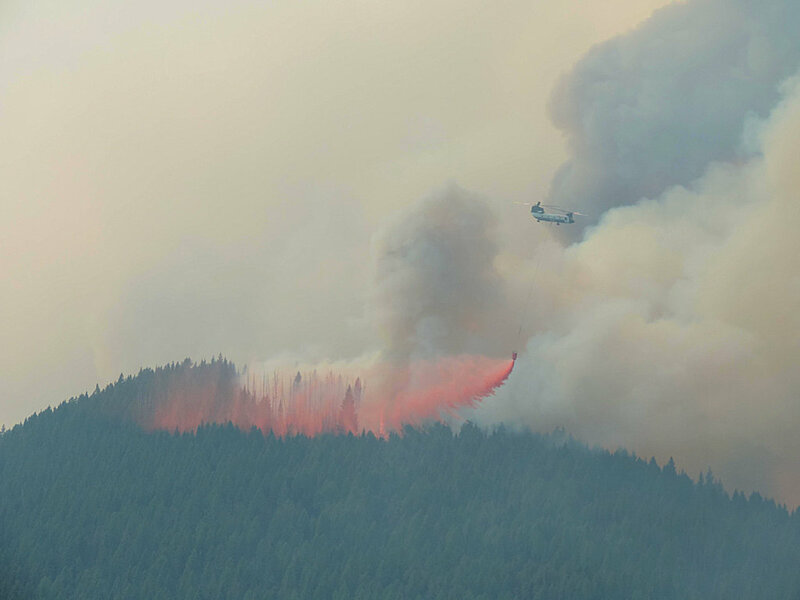 The Damnation Fire was at 150 acres Friday before active burning in the Damnation and Lewis creek drainages increased its size. The fire, approximately 21 miles east of Swan Lake, is burning primarily in previously burned areas, particularly the area burned by the Lewis Fire in 2000. The Forest Service is dealing with two lightning-triggered fires in the Bob Marshall Wilderness. Here’s the official press release . 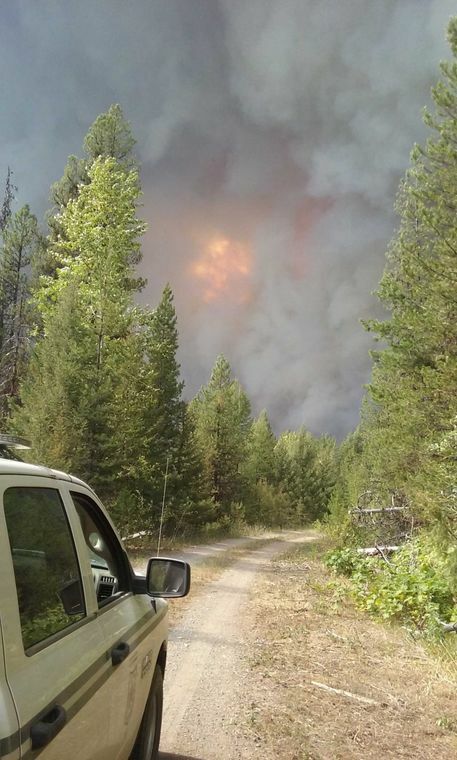 . .
Fire managers on the Flathead National Forest are managing two fires on the Spotted Bear Ranger District. Both are believed to have been started by lightning strikes from the storm that passed through the area on August 11, 2013. Both are in the Bob Marshall Wilderness area and will be managed so they can play their natural role in the wilderness while providing for public and firefighter safety and protecting values at risk. The Snow Creek fire is burning about 20 acres and is located up the Snow Creek Drainage. The fire is close enough to Black Bear Cabin that fire fighters are starting to implement structure protection, but there is no immediate threat. There may be some future impacts to the trails in the area depending on where the fire grows. The Damnation fire is covering more than 150 acres and is growing to the east and north-east. This fire could impact trail access as well. Managers are working to keep area trails open with crews on the ground to observe fire location and behavior; however trail closures to ensure public safety may occur as fire conditions dictate. Growth is expected today, August 16, 2013, as the weather forecast calls for high temperatures, low relative humidity and wind. Please contact the Spotted Bear Ranger District before heading into these areas to ensure you have the latest information on conditions: 406-758-5376. As firefighting resources are needed to respond to natural wildfires it becomes even more important for everyone to thoughtful and careful in their use of fire in the forest. The forest is not currently in fire restricts, but the fire danger is high in the Flathead Valley, meaning a small spark or an unattended fire of any kind can start a wildfire and it could quickly spread. The Patagonia company is giving the Bob Marshall Wilderness Foundation some significant support over the next five years . . . The outdoor clothing company Patagonia recently pledged its support for the Bob Marshall Wilderness Foundation by sponsoring one trail project per year for the next five years. Patagonia is the first corporation to make a long-term commitment toward the sponsorship of individual trips, according to the BMWF. The work is critical for keeping trails open for the public who seek solitude in the wilderness, according to the local foundation. What appear to be a couple of relatively minor wildfires were detected in Flathead National Forest on Monday . . .
Two new fires were detected on the Flathead National Forest Monday, and both are being suppressed. The Gorge Fire was less than an acre, burning about 10 miles northeast of Condon in the Bob Marshall Wilderness. Another fire, located near Dry Lake on the Swan Lake Ranger District, hadn’t been named or sized up as of Monday afternoon.